FAIRY ATMOSPHERE – Solar powered 150 LED string lights have steady on and flashing 2 lighting modes, easy to create a magic joyful ambience for parties and holidays. FLEXIBLE & DURABLE – Easy to mold into different shapes for various decorative occasions, durable silver wire resist to bend and break. WATERPROOF & SAFE – IP65 waterproof rating and UL listed, suitable for outdoor and indoor use, light strings remaining cool after long time use. 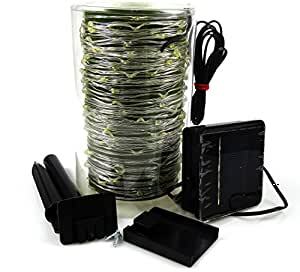 EXTENSIVE APPLICATION – Solar powered string lights are ideal decoration for window, bedroom, pathway, patio, garden, wedding, party, tree, etc. CONVENIENT TO COLLECT – The rope lights are twined around the plastic cylindrical box, easy to roll it up for storage. High bright 150 LED, with 4 inches spacing between 2 LEDs, energy-saving, low voltage and without plug-in, steady on and flashing 2 lighting modes for you to choose. Easy to mold into different shapes for various decorative occasions, durable silver wire resist to bend and break. IP65 waterproof rating and UL listed, suitable for outdoor and indoor use, light strings remaining cool after long time use. Small size, convenient to carry. The rope lights are twined around the plastic cylindrical box, easy to roll it up for storage. Solar powered string lights are ideal decoration for window, bedroom, pathway, patio, garden, wedding, party, tree, etc. 1. Charge the solar light for at least 8 hours in direct sunlight for the first use, which will allow the battery to reach its maximum recharging capacity. a) Make sure the power switch knob is slid to the âsolid / flashingâ position. b) Check the battery to ensure it is securely in contact with the terminals. c) Ensure that the product is placed in an area where the solar panel can absorb direct sunlight. Usage: window, bedroom, pathway, patio, garden, wedding, party, tree decoration, etc.